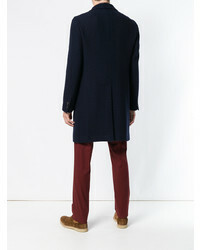 If you're searching for a casual yet on-trend look, opt for an Etro navy overcoat and navy sweatpants. These two pieces are very comfy and they also look fabulous when worn together. Throw in a pair of grey athletic shoes to make the look current. Pair an Etro Single Breasted Coat from farfetch.com with grey vertical striped dress pants to ooze class and sophistication. You could perhaps get a little creative in the footwear department and lift up your outfit with black leather oxford shoes. 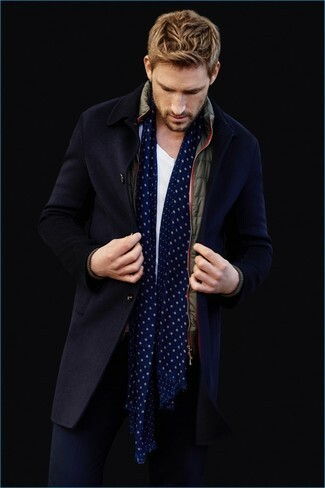 If you're on the lookout for a casual yet sharp outfit, go for an Etro navy overcoat and blue ripped jeans. As well as very comfy, these items look great together. For something more on the daring side to round off this getup, grab a pair of white high top sneakers. 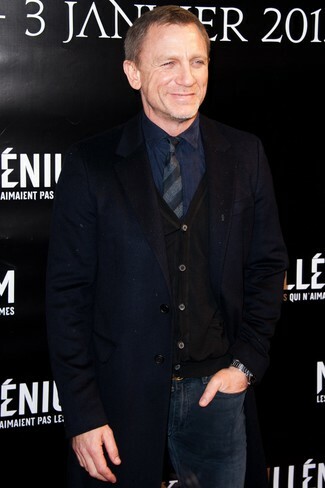 Try teaming a navy overcoat with navy dress pants like a true gent. For something more on the daring side to round off this ensemble, rock a pair of dark brown leather derby shoes. So as you can see, being a dapper dude doesn't take that much the workplace. 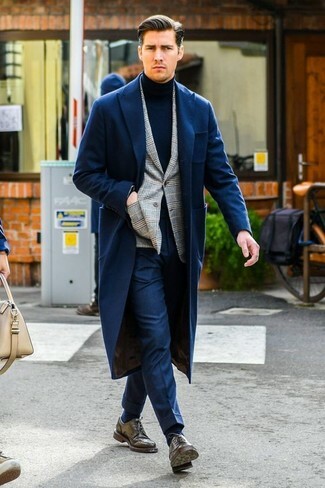 Just make an Etro navy overcoat and navy jeans your outfit choice and you'll look good. Complement this outfit with dark brown leather casual boots. A modern man's sophisticated closet should always include such stylish essentials as an Etro navy overcoat and black vertical striped dress pants. Go for a pair of black leather loafers to have some fun with things. So as you can see, looking seriously stylish doesn't take that much work. 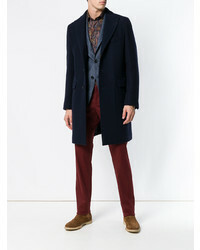 Just pair an Etro Single Breasted Coat from farfetch.com with navy jeans and you'll look amazing. 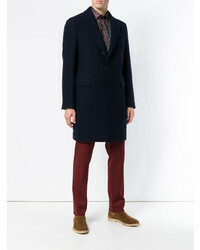 For a smart casual look, team an Etro single breasted coat with navy chinos — these items a work setting really smart together. 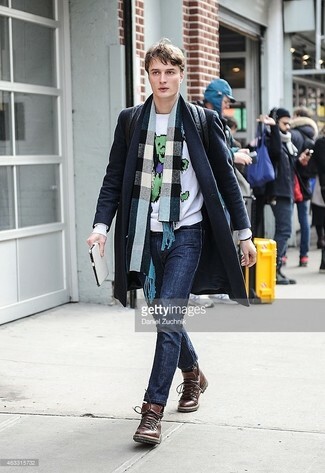 So as you can see, ensembleing seriously stylish doesn't take that much the place of work. 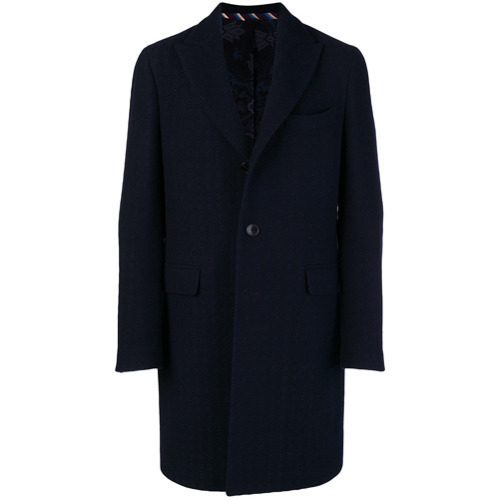 Just wear an Etro navy overcoat and white chinos and you'll look amazing. Spruce up your ensemble with brown suede chelsea boots.